Take advantage of winter downtime and start your beekeeping venture now, before the pollinators become available for delivery in early spring. The directions below detail construction of the hive’s base and inner and outer covers, plus five supers for collecting honey. 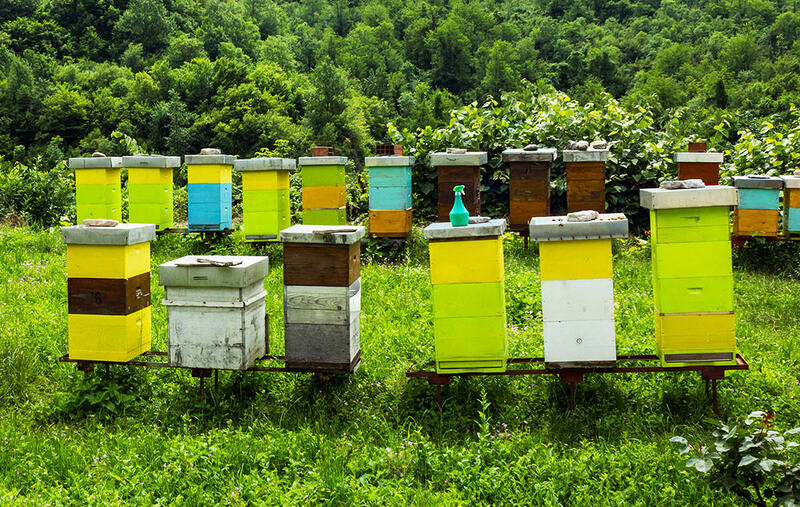 Come springtime, you’ll begin with two honey supers (each outfitted with 10 waxed frames), adding the remaining supers and frames as necessary to accommodate your bees’ rising comb production. Though optional, one coat each of primer and exterior paint will help your handiwork weather the elements. Just be sure to use a no-VOC formula and limit it to exterior surfaces only. 1. Cut the ¾”-thick plywood sheet into two pieces: one measuring 21¾” Á— 18¼” for the telescoping cover (T3), the other 22″ Á— 16¼” for the bottom board (B5). 2. Cut the ¼”-thick plywood sheet to 19â…›” Á— 15½” for the inner cover (I3). 3. Rip (cut lengthwise) each of the pine 1Á—12s into two pieces: one measuring 6â…” wide, the other 4½” wide. 1. Cut the 2¼”-wide pine board into two 21¾”-long pieces (T1) and two 16¾”-long pieces (T2). 2. Cut the ¾”-wide pine boards into two 19â…ž”-long pieces (I1), two 14¾”-long pieces (I2), two 19â…›”-long pieces (B3), and one 16¼”-long piece (B4). 3. Cut the 6â…”-wide pine boards into ten 19â…ž”-long pieces (H1) and ten 14¾”-long pieces (H2). 4. Cut the 2″-wide pine boards into ten 16¼”-long pieces (H3), two 22″-long pieces (B1), and two 14¾”-long pieces (B2). Make the telescoping cover. Align the T1 and T2 pieces specified in “Cutting the Lumber” to form a rectangle, sandwiching the shorter pieces (T2) inside the longer ones (T1). Using the power drill fitted with the ³â„â‚ƒâ‚‚” bit, drill 2 holes along the edges of the T1 pieces (as shown). Nail together using 8 of the galvanized nails. Attach the plywood telescoping cover (T3) to the top, using 20 of the trim nails. Make the inner cover. Use the table saw* to make a 3/8“-deep by 1/4“-wide groove in the I1 and I2 pieces specified in “Cutting the Lumber.” Slide the 1/4“-thick plywood (I3) into that groove (as you would fit a pane of glass into a window). Ensure that I3 fits properly with the I1 and I2 pieces to form a perfectly flush frame. Then disassemble, glue the grooves, insert the plywood, and reassemble. Nail together using 8 of the trim nails, as shown. Using the jigsaw, cut a 31/4” by 11/4” oval in the center of the inner cover (for ventilation). Make each honey super. Use the table saw* to cut a 5/8“-deep by 3/8“-wide notch out of 1 short side of each of the H2 pieces specified in “Cutting the Lumber.” (Ten hive frames will rest atop these notches inside each super when the hive is assembled.) Using the power drill fitted with the ³â„â‚ƒâ‚‚” bit, drill 5 holes along the edges of the specified H1 pine pieces (as shown). Create a box by sandwiching the shorter pieces (H2) inside the longer pieces (H1). Glue the joints, then hammer a galvanized nail into each pre-drilled hole. Using the power drill fitted with the âµâ„â‚ƒâ‚‚” bit, drill 4 holes along the length of each handle piece (H3), and attach to the supers using 4 of the screws on each side (as shown). 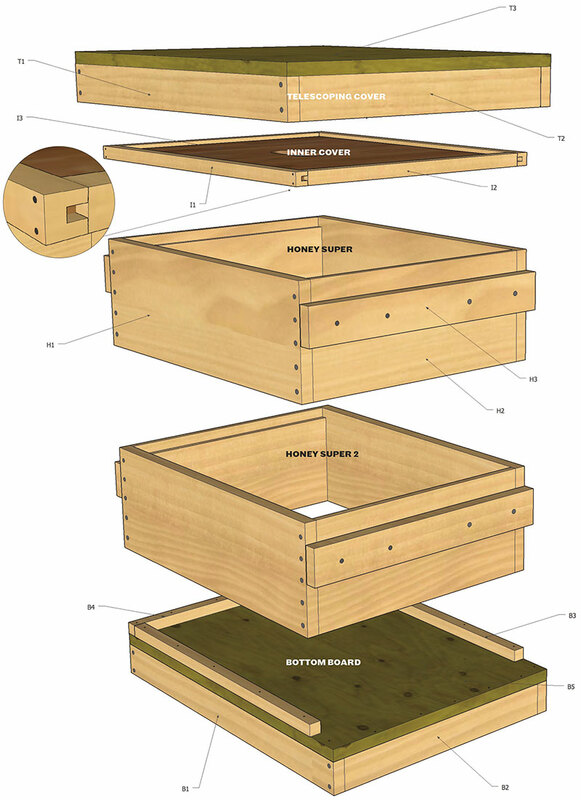 Repeat these steps with the remaining specified pine pieces to make 4 more supers. Make the bottom board. Align the B1 and B2 pieces specified in “Cutting the Lumber” to form a rectangle (as shown), sandwiching the shorter pieces (B2) inside the longer ones (B1). Using the power drill fitted with the 3/32” bit, drill 2 holes along the edges of the B1 pieces (as shown). Nail together using 8 of the galvanized nails. Attach the remaining 3/4” plywood piece (B5) to the top, using 20 of the trim nails (as shown). Align the B3 and B4 pine pieces atop the plywood and nail in place using 15 of the trim nails (as shown). This U-shaped platform will create a gap at the front of the hive, allowing bees to enter. Assemble the hive. In each super, hang 10 frames with wax foundation from the notches you made. Stack the bottom board, 2 of the supers, the inner cover, and the telescoping cover. Insert the entrance reducer into the gap between the bottom board and the adjacent super (to discourage robbing by other bees and to control ventilation). As the season progresses, add more supers to the hive. *Power saws can cause serious injury; please follow the safety instructions in your owner’s manual. Make sure to wear protective eyewear. I am very interested in starting a colony of bees. As a retired environmental civil designer, I want to continue the honey bee species here in Massachusetts.I love what they produce and contribute to our eco system I have the time and ambition but I need some basic instruction to set the wheels in motion. A good informative book is a good start for me,can you assist me?